Assess the situation and get ready to n-strike your opponents. 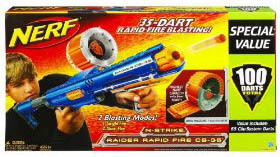 The Nerf Raider CS-35 NVP Blaster features a pump-action handle to give you total control of firing speed. The drum magazine holds 35 Clip System darts, giving you massive soft ammo capacity. A clear window lets you see how many foam darts you have left. Two Nerf blasting modes (single and multi) give you defensive flexibility. Use the slam-fire mode for multiple shots or the slide mode for single shots.